Corpus Christi is an occasion for us to celebrate the sacrament of the Eucharist. It should also be an occasion when we enter into the symbolism of this great sacrament, letting it teach us deep lessons about life, our relationship with God and with one another. Meditation on the readings for the feast will help us to celebrate the feast in both ways. St Luke’s account of the miraculous feeding is very helpful as it is both a teaching on the Eucharist and on Jesus’ way of relating with people. The story is introduced in verse 11 by a brief summary of Jesus’ ministry: “talking about the kingdom” is a powerful expression referring to the goal of his life. Feel free to enter into the story of the feeding at whatever stage touches you. Verses 12 to 14a set the stage for the miracle. Note the contrasting responses of Jesus and the twelve. Verses 14b to 16 describe the feeding. The gestures of Jesus are reminiscent of the Eucharist, but are highly significant in themselves. So, too, verse 17 is symbolical both of the Eucharist and of life. Lord, we thank you for the Holy Eucharist. Every Sunday, all over the world, people sit down in their church communities. 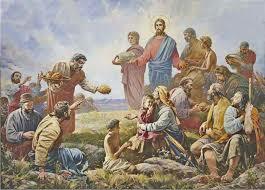 then he breaks the bread and distributes it among the crowd. is collected and reverently stored. 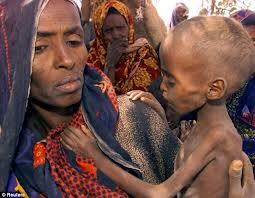 with nourishment that is unworthy of their humanity. curing all those who need to be healed. speaking to them about the kingdom you are establishing in the world. – long lines of people outside food stores. – are we to go ourselves and buy food for all these people? break the bread and hand it around to be distributed among the crowd. but when the remaining scraps are collected, we will fill many baskets. we have as much as we want, and even twelve baskets of scraps left over. we will never be true followers of Jesus. Since the very first days of the church — before St Paul had set out on his journeys or any of the gospels were written — our brothers and sisters have been gathering every week for this sacred meal. But when we routinely do anything, we often lose sight of just how wonderful it is. So today we are reflecting on just how wonderful it is to be called by the Lord to gather in his presence, to be his guests at his table, and to eat and drink from his wonderful bounty. In this banquet we become one with Christ, and are transformed into being his Body, and his Blood flows in all our veins giving us the strength to be his witnesses in the world and the life that never ends. 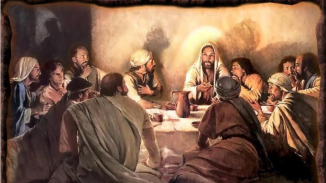 From the beginning the Eucharist was understood within the pattern of Christ’s meals/feedings, so already when this story was incorporated by Luke into his text, it had Eucharistic significance: his meal is one of miraculous abundance for all. 1. The whole point of today is to cause us to reflect that we encounter the mystery of Christ in events which belong simultaneously to this world and to the world to come. As Jesus Christ is the sacrament between the mystery of God and our humanity, so he has left us the sacraments, above all this meal, as the means by which we encounter, here and now, the future banquet of heaven. (Step A) If you live in an area where drinking from the cup is not standard (e.g. Ireland), then introduce it today. (Step B) If you live where communion ‘under both species’ is normal (most English-speaking countries) then procure some of the very large breads that allow for a genuine fraction. The key to the symbolism of the Eucharistic meal is not bread as a generic substance, but a single loaf of bread. This has simultaneously the notion of scattered grains gathered into a unity – one loaf – and the notion of each person having a share (literally: participating) in that loaf which is Christ. (Step C) If you are actually doing in the liturgy what we say we do (breaking the loaf, drinking the cup) then arrange for the congregation to stand around the table, become actual ‘circumstantes’, for the Liturgy of the Eucharist. The normal arrangement is that of a sanctuary which is akin to the teacher’s part of the classroom or the stage in a theatre, and those in the audience / class area watch on and answer invitations to speak. Yet we are always talking about being ‘gathered around the Lord’s table’ – so give people the actual liturgical experience. 3. The experience of the liturgy should act as a pointer, through faith, from what happens here to another reality. When the liturgy is celebrated in a minimalist, token fashion it is its own undoing. Then what actually happens (you go into a pew, listen to words, see the altar up there, walk up to communion, taste a little round pre-cut wafer that does not seem like bread, and then move off) must first point to what should happen here (look at the liturgy’s formulae), before, it can point beyond this dimension to the mystery. When your liturgy demands this double pointing (we got away with it pre-1965 in Latin for the linguistic inaccessibility was a mystical screen, an iconostasis, which made just being there enough), it sends out a signal that it is just a ritual of words. 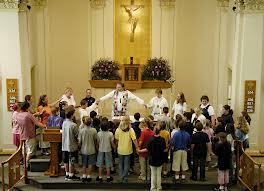 And when the Eucharist appears to be just that, then people vote with the feet – and they are doing so! You might expect that on a feast to commemorate the Eucharist we would be reading a text describing the last supper. However, since the last days of Jesus life were vividly recalled during Holy Week, we are now invited to reflect upon the meaning of the events and that is why today we are considering the miracle of the loaves and fishes. This was a highly symbolic act on the part of Jesus because, not only does it echo the Old Testament miracle of the manna in the wilderness, it also indicates Jesus’ desire to nourish his followers as they journey with him on the road of faith. The Eucharist is precisely that, and every time we gather for it we recognise that we are pilgrims in need of the sustenance that only God can give. When Jesus said ‘do this in memory of me it is clear that he was not only referring to his actions relating to the bread and wine. He was asking his followers to live out this symbol of his life giving love. This is made very clear in the fourth gospel where, instead of the Passover meal, John reports that Jesus knelt down and washed the feet of his disciples and afterwards told them that they must do the same. The Eucharist as a sacrifice and meal involves us not simply in a prayerful ritual but also commits us to a way of relating to each other. If we are truly devoted to the Lord’s presence in Holy Communion then we will also be truly devoted to his presence in the community, especially in those who are most in need. Many people have memories of the Corpus Christ procession when the monstrance with the Blessed Sacrament was brought around the parish. All groups in the parish were represented. Children scattered petals before the host and houses were decorated. The meaning of the feast was to bring the Lord into the streets of his people and to appreciate the gift he gives us of himself in the Eucharist. This procession still takes part in many places. On Holy Thursday we also celebrate the Eucharist, but in another way It is more of the sacrifice of Jesus on Calvary. We unite ourselves with his offering that brought him to death, and look forward to the resurrection when the risen Lord would be present in many ways among people, including in the form and shape of bread and wine. On the feast of the Body and Blood of Christ, the emphasis is more on gift than on sacrifice. We need this gift. We need to know certainly that God is close with us in life, and the Eucharist at Mass gives us this certainty. We need to know that God is really present in our lives, and we know this in the real presence of the Eucharist. help me to live like you and love like you. Amen. THE WORD: Taking the five loaves and the two fish, and looking up to heaven, Jesus said the blessing over them, broke them, and gave them to the disciples to set before the crowd. Today’s celebration of the Body and Blood of the Lord originated in the Diocese of Liege in 1246 as the feast of Corpus Christi. In the reforms of Vatican II, the feast was joined with that of the Precious Blood (July 1) to become the Solemnity of the Body and Blood of the Lord. We celebrate today the Christ’s gift of the Eucharist, the source and summit of our life together as the Church. Today’s Gospel is Luke’s account of Jesus’ feeding of the five thousand with five loaves of bread and two pieces of fish (the only one of Jesus’ miracles recounted in all four Gospels). As he does throughout Luke’s Gospel, Jesus performs a miracle out of his deep sense of compassion for the suffering and needy – but, first, Jesus asks the Twelve to gather up whatever they can from the community; with these few, shared gifts Jesus creates a community of thanksgiving, a community of Eucharist. A sacrament, St. Augustine said, is the visible sign of God’s invisible grace. The gifts we give to one another are sacramental when they manifest the love and mercy of God; they are Eucharistic when they transform us into a community bound by that love. In our sharing of the body of Christ, we are called to become the body of Christ for one another: to make the limitless, complete love of Christ reality for all. Christ calls us to be both guests and waiters at his table. We come here with our struggles and doubts and pains and sorrows to be fed and nourished; at the same time, the Eucharist should impel us to become Eucharist for others -- to make the limitless, complete love of Christ real for all in our own acts of charity and kindness. While the kids are getting dressed for school, Mom is in the kitchen making their lunches. Katie likes her sandwiches cut in quarters; Bobby prefers strawberry jam. As she packs the sandwiches, she smiles, imagining the delighted look on their faces when they open the dessert treats she places in the bag. What she is doing is a sacrament – not the miracle of transubstantiation, but certainly parallel to it, moving in the same direction. If she could give her love to her children to consume again and again, like the loaves and fishes going endlessly into their mouths and stomachs, she would do it in an instant. A few days before Christmas, the kids take over the kitchen to make Christmas cookies. Mom is there too, more to protect her kitchen than to supervise. Truth be told, the cookies that result are anything but spectacular – the reindeer-shaped cookies look more like fat cocker spaniels, the Santa cookies bear no ready resemblance to the jolly old elf, and the red and green sparkles are piled on rather than sprinkled. But the kids have a ball – and are making memories that they will remember long after they celebrate this same messy sacrament with their own children. Her heart is breaking for her friend and all that she and her family have had to endure: the diagnosis, the difficult surgery, the chemotherapy, the unknown future. All she can do for her is pray – and make lasagna. And so she does. Two or three times a week she takes her turn making some hot dish for her friend and her family. The food that she and the other friends prepare is nothing less than sacrament – compassion and concern made real in cheese and meat sauce. A sacrament, St. Augustine said, is the visible sign of God's invisible grace. The gifts we give to one another are sacramental when they manifest the love and mercy of God; they are Eucharistic when they transform us into a community bound by that love. Today's feast of the Body and Blood of the Christ celebrates Christ's gift of the Eucharist, the source and summit of our life together as his Church. In our sharing of the body of Christ, may we become the body of Christ for one another – to make the limitless, complete love of Christ real for all. The first reading from the book of Proverbs extols the creative power of God in the wonders of the Universe. As we contemplate God's handiwork ranging from sky to sea, we can't help but reaffirm our faith in God's power. We become especially aware of his presence in our lives as we sometimes are confronted by disorder and chaos; when we are caught up in disasters and accidents and yet miraculously saved. What is said of the wisdom of God could be applicable to us as well. "When he established the heavens I was there ... I was daily his delight, rejoicing before him always, rejoicing in his inhabited world." We may doubt it but we are always in the mind of God. He is the Creator-God, the Father-God, who delights in us, His children. I have often thought it would be a blessing if each human being were stricken blind and deaf for a few days sometime during his adult life. Darkness would make him more appreciative of sight. Silence would teach him the joys of sounds. Now and then I have tested my seeing friends to discover what they see. Recently I asked my friend who had just returned from a long walk in the woods, what she had seen. "Nothing in particular," she replied. How was it possible, I asked myself, to walk for an hour through the woods and see nothing of note? I, who cannot see, find hundreds of things to interest me through mere touch. I feel the delicate design of a leaf, I pass my hands lovingly about the smooth skin of a silver birch, or the rough shaggy bark of a pine. In spring I touch the branches of trees hopefully in search of a bud, the first sign of awaking nature after winter's sleep. Sometimes if I am fortunate, I place my hand gently on a small tree and feel the happy shake of a bird in full song. In today's gospel Jesus tells his disciples in one of his final discourses that he had come to reveal the Father, this was his mission and the purpose of his life. He had come from the Father and he was going back to the Father, but he had much more to reveal and say to them. All that he wished to say to them would be revealed only when they received his Spirit. It was through the Spirit that they would understand the Father and the Son of God. The special way in which God the Holy Spirit gave glory to God the Son, seems to have been his revealing him as the Son of the Father, who had appeared as the Son of man. From the gospels we know that though Peter acknowledged Jesus as the 'Son of God' he did not understand what he was saying. So did the centurion, who at the crucifixion acknowledged and said, "Truly, this was the son of God." In our own lives, though we claim that Jesus is our Saviour and Lord, we do not understand the implications or the consequences. Only when we are enlightened by the Spirit will we truly know and acknowledge that Jesus is Saviour and Lord. Walker Percy, in 'Lost in the Cosmos' muses ironically about the strange fate of post moderns, who spend millions trying to get chimps to talk and billions on space stations attentively listening for an extraterrestrial blip that might speak to us. At the same time these very people have no time to listen to one another and still less time to hear anything that God has to say to them. Percy ends his 'Lost in the Cosmos' with a fantasy that spaceship earth is indeed addressed by an extraterrestrial being. A persistent signal questions us: "Repeat. Do you read? Do you read? Are you in trouble? How did you get in trouble? If you are in trouble have you sought help? If you did, did help come? If it did, did you accept it? What is the character of your consciousness? Are you conscious? Do you have a self? Do you know who you are? Do you know what you are doing? Do you love? Do you know how to love? Are you loved? Do you hate? Do you read me? Come back. Repeat. Come back. Come back. Come back..."
A young man asked Socrates how he could get wisdom. Socrates replied, "Come with me." He took the lad to a river, pushed his head under water, held it there until he was gasping for air, and then released his head. When the lad regained his composure, Socrates asked him, "What did you desire most when you were under water?" "I wanted air", said the lad. "Did you think of anything else" asked Socrates. "Are you joking? How could I?" the lad remarked. Socrates smiled and said to him, "You wanted air so badly, you could think of nothing else. In a similar way if you want to attain wisdom earnestly, you will get it." 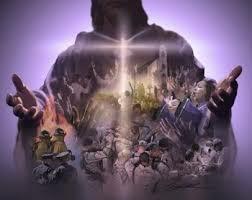 - We attain our spiritual desire, we attain God, if we desire Him above all things in life. Do we see God? - It's a matter of perspective! A shoe company in Nashville, Tennessee, USA, sent two of its top salesmen to an African country to analyze its capital as a new market for shoes. The two men stepped out of the plane and as they went around, they saw that almost every person in sight was barefoot. One of the men was discouraged and sent a cable back to his company: "No one here wears shoes. No chance of a new market. Coming home." However, the other man saw the situation in a different light and cabled: "No one here wears shoes. Great opportunity! Double my first order!! Henry Kissinger in his book Years of Upheaval narrates one incident that took place the night before President Nixon resigned. Kissinger was at home having dinner with his wife, Nancy, his children and columnist Joseph Alsop, when Nixon phoned and asked him to come right away to the White House. When Kissinger arrived, he found Nixon slouched in a brown chair. A thin beam of light from a small reading lamp fell on a yellow pad in his lap. The rest of the room was in shadows. The two talked about many things. Then about midnight, Kissinger got up to leave. Nixon escorted him to the elevator. Suddenly Nixon stepped just outside the door of the Lincoln bedroom. He asked Kissinger to kneel in prayer with him. Nixon recalls that both knelt. Kissinger does not recall if he knelt or not. He does recall, however, being "filled with a deep sense of awe" and not knowing "what to pray for." -The image of Kissinger kneeling in the darkness, filled with awe and not knowing what to pray for is a good image of many of us as we consider today's feast of the Holy Trinity. We too are filled with awe, but we don't know what to pray for or how to pray to the Trinity. But it does not matter, for the Spirit prays with us and in us and leads us to the Father. "There are cathedrals famous for their stained-glass windows. Such windows looked at from the outside are not remarkable, but from inside -what a world of colours we see! The mystery of the Trinity may have something similar about it. It can be made into a cold abstract doctrine, instead of the glowing centre of our life. We are so small and weak on this earth of ours, this cradle of clay from which we look at the unreachable stars. But one day someone did come to open up men's horizons. His manner of acting had a quiet strength, like the light of a warm dawn overcoming darkness; his words had the power to lift men up and give them back their strength. For all that, rather than draw the forces of love he released to himself, he always directed them to his Father, from whom he held his very being. Those who lived with him and heard his word could not understand it straight off. When he disappeared from their sight, having loved them as no one else had done, they found they were not abandoned. An inner strength, his spirit guided them towards the complete truth of him whose path they had shared for a time. It was like an ongoing unveiling of the meaning of what he had said and done once for all - the discovery, as it were, before their eyes, of the Christian meaning of history and salvation. " The Spirit comes to set us free...When I was growing up in the country, there was a man who used to come around from time to time buying hens. He would buy a hen, tie her legs with a bit of string, and throw her into the back of his donkey-drawn cart. One day he decided to give us local yokels a lesson in hen psychology! He took a penknife out of his pocket, reached into the cart, and snipped the twine tying the legs of one of the hens. I was convinced the hen would fly away, but I discovered that the man knew more about hens than I did! The hen was free, but she didn't know she was free, because all the other hens around her were not free! He was convinced that the only time the hen would fly away would be if he snipped the twine tying the legs of all the hens. In that case they would all fly away. It is so easy for any of us to forget that we are free, that we have the Spirit who leads us into all truth, and that the Spirit will set us free. The Three HermitsLeo Tolstoy relates the folk-tale of 'The Three Hermits' current among the Russian villagers. A bishop visited a lonely island where three holy men were living for the salvation of their souls. All the three hermits were very old, past hundred years. For the most part they lived in silence, and spoke but little even to one another. "Tell me," said the Bishop, "what do you do to save your souls, and how do you serve God on this island?" The oldest one said, "We help each other and pray thus: "Three are You, Three are we, have mercy on us." And when the old hermit said this, all the three raised their eyes to heaven and repeated: "Three are You, Three are we, have mercy on us." The Bishop smiled and said, "You have evidently heard something about the Holy Spirit. But you do not pray aright. I will teach you to pray." He proceeded to explain to them how God had revealed himself as the Father, Son and Holy Spirit. He then began to teach them how to pray the Our Father and made them repeat it after him. But as the prayer progressed, they being old fumbled and could not repeat it completely. As it was getting late the bishop took leave from them and boarded ship but the old hermits followed him shouting, "We have forgotten your teaching. As long as we kept repeating we remembered it but when we stopped saying it for a time we have forgotten parts of it. Teach us again." The Bishop crossed himself and leaning over the ship said, "Your own prayer will reach the Lord, men of God. It is not for me to teach you. Pray for us sinners." And the Bishop bowed low before the old men; they turned and went back across the sea. And a light shone until daybreak on the spot where they were lost to sight. In America in the 1860's, when covered wagons were heading west, the leaders always dreaded the fording of the River Platte. The current was so changeable in the broad, muddy stream that not even experienced scouts could tell where the pockets of quicksand and potholes lay. When an ox-team got stuck, the wagon was usually overturned, dumping family and possessions into the river. The difficulty was easily overcome. When a large number of wagons had arrived at the river, the Oxen from all of them were hitched together in a long line to pull each of the families across in turn. Even though one team in the long line floundered, there were always enough on sure footing to keep the wagon on the move. Today’s reading alludes to the kinds of sacrifices the ancient Jews offered and the use of blood. The blood used was a sign of the Israelites’ ‘covenant’, a special word the Hebrews borrowed from others. As their neighbours used the word, it was a pact or contract, between unequal parties, like the king and his subjects, a landowner and his tenants; a pact freely entered into, binding perpetually, and sealed in blood. Moses is referring to the pact and covenant with God and this pact was sealed with a sacrifice, a religious act of worship offered to God alone. Moses splashed the blood on the altar of sacrifice, representing God and he splashed the remaining on the people, binding the two together. The people would honour the pact by agreeing to keep the commandments and being faithful to God, in return for his protection of them. Furthermore the people identified with the sacrifice by eating a portion of the victim being offered. Meal sharing was regarded as very sacred in antiquity. One did not sit down to eat with the enemy. But, by eating, one signified acceptance of, and respect for the person providing the meal. Jesuit Ignacio Ellacuria of El Salvador, Franciscan Maximilian Kolbe of Poland, Sr. Rani Maria and Australian missionary Graham Staines murdered in north India, appear very diverse in their lifestyles, yet. little divided them in death. All these are martyrs who shed their blood that others might live. They represent modern ‘bodies of Christ’. Today, celebrating the feast of the body and blood of Christ, we could reflect on the sacramental symbols of blood and body and our Christian calling. -Some years ago, Jesuit philosophers of Satya Nilayam in South India, formed a group called ‘Blood Brothers’ comprising of students who were willing to regularly donate blood. Indeed, we are all truly ‘blood brothers and sisters’ saved by the supreme sacrifice of our elder Blood Brother, Jesus. Moreover, Martyrs like Ellacuria, Kolbe, Staines and Rani Maria are but representatives of a long list of ‘blood brothers and sisters’ whose life was truly Eucharistic. May the Corpus Christi called ‘Church’ be ever willing to break itself and bleed in selfless service of society at large. In today’s gospel we have Mark’s account of the Last Supper. Most of the gospel, the longest part, has to do with the preparation for the meal. This was no haphazard, hurried, get-together. It was planned to the last detail. It was a sacred event and deserved to be treated as such. This last meal was be celebrated in peace, to savor the gift that was being offered. Jesus was continuing something that had been going on as the Jews’ way of offering worship and love to God and thanks for their deliverance since they left Egypt- the Paschal meal. Mindful of the sacredness of that meal, Jesus was careful to do in correct minute detail what had been prescribed. What He did in the Upper Room was, first of all, an adaptation of the Passover of the past. The Passover meal was also an anticipation of Jesus’ offering of himself and a commemoration for the people of the future. In addition to being an adaptation of the past and an anticipation of the future, what Jesus did at the Passover was important for what he was doing now. “This is the blood of the covenant,” he said. He was signing the covenant with his own blood which will be poured out for mankind. A key event in the life of the Jews was their escape from Egypt and the anniversary for this milestone became the most significant festival in their religious calendar. It was steeped in traditional ritual requiring detailed preparations. So when Jesus sent the disciples to prepare for their Passover feast, it caused no surprise. But when he changed the traditional blessing over the bread and wine in order to give us his Body and Blood, The disciples must have been truly astounded and did not grasp the wonder of what he had done until the fullness of the Spirit came upon them. The feast of Corpus Christi is a reminder and a celebration of God’s gift of himself to us and a pledge of eternal life and resurrection. This is our faith and our hope. A modern theologian, Tad Guzie, in a book called Jesus and the Eucharist, begins his explanation of the real presence of Christ in the Eucharist with a very simple but valuable distinction. He maintains that there are two questions to be asked in order to get to the fullness of any reality: the empirical question (what happened?) and the human question (What does it mean for human beings?). “A young man places a rose on a patch of ground outside the city limits on the third day of May every year.” “A middle-aged woman eats one soft-boiled egg and one slice of protein-enriched bread, toasted and without butter, for breakfast daily for twenty years.” These are clear statements about actual realities but, they can be banal and uninteresting. When we learn that the young man is placing the rose on the grave of his grandmother whose birthday was May 3, a woman who took him in when his parents deserted him, raised him by herself as a widow, then we see clearly why the human question is far more important than the empirical question. When we learn the breakfast-eater is a woman whom the doctors gave up on twenty years ago, a woman who has disciplined herself to ear exactly what will keep her delicate health in balance, a woman determined to continue her career as an activist social worker and willing to made any sacrifice necessary to do so, a woman who would be dead if she overate slightly then we see again why the question of meaning is enormously more significant than the question of simple fact. 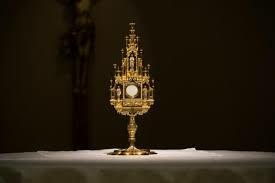 -Jesus Christ is really present in the bread and wine of the Eucharist. This is a fact of faith. But since the first great controversies of the ninth century about how Christ is present, we seem to have placed far too much emphasis on figuring out the fact and not really enough on its meaning. For all of us there comes a last time for doing the litany of familiar things that we do always. There is the last time we see our family and friends; the last time we write a letter, hear a name spoken share a family meal. Perhaps it is a mercy that most of us don’t know when the last time arrives, that we are never sure when our goodbyes have the accent of finality. Even the dying can still hope that they will feel again the comfort of human touch, will hear the blinds being drawn, will smell the promise of breakfast. There is always a crazy hope that there will be another time.- In today’s Gospel Jesus prepares for the last time with his friends: he knows that the final moments are upon him. This is to be the last opportunity for him to share with his followers. Preparations are carefully made; the last meal must be celebrated in peace, to savour the gift that will be offered. The gift is a surprise. Jesus gives himself. Literally. “Take it, this is my body… This is my blood…” The close association that Jesus has had with his followers is about to come to an end. That fellowship will be renewed in full only in the kingdom of God, when they will all drink a new wine together. In the meantime, the followers of Jesus must gather to share a simple memorial meal. Until the fullness of the kingdom the sharing of that meal must satisfy their hunger for God, their longing for the presence of Jesus. The meal of fellowship has to be enough for them. As it has to be enough for us. 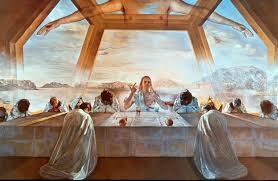 Leonardo da Vinci was 43 years old when the Duke of Milano asked him to paint the Last Supper. He worked on it slowly and with meticulous care to detail. He spent much time making the cup that Jesus held as beautiful as possible. After three years he was ready to show it, and he called a friend to come and see it. He said, “Look at it and give me your opinion.” The friend said, “It is wonderful. The cup is so real I cannot take my eyes of it!” Immediately, Leonardo took a brush and drew it across the sparkling cup. He exclaimed as he did so: “Nothing shall detract from the figure of Christ!” Christ must be the primary focus of a Christian’s life. Like our Lord who gave himself fully to others, may we live and love to give! Diagnosed with chronic kidney disease a year-and-a-half ago, 30-year-old Rasad Muhammad's hope of living had sunk with each passing day as a donor remained elusive. Until last month, when his saviour appeared suddenly — in the form of a Christian priest he had never met before. Father Kidangathazhe Sebastian, 41, will donate one of his kidneys to Rasad so he can live. Preparations are under way, and the transplant surgery is likely to be performed next month. February 25, 2013 was a unforgettable day for Rashad on which he met Father Sebastian in a bus to the hospital. Rasad had boarded a bus from Aluva to go to Kochi for his check-up. Fr Sebastian, who is associated with the Catholic Goodness TV, and who was then not wearing his cassock, was seated next to him. "He looked very weak and burdened. 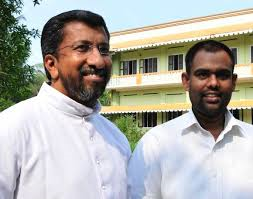 He told me the story of his tragedy and his desperate search for a kidney donor," Fr Sebastian said. "I was seized of the pain of a life facing death. I made a cursory query about his blood group, which matched mine." For the priest from Idukki, the fortuitous match held special significance. It signalled to him the end of his silent quest to practise what he had been preaching. "Inspired by the story of Fr Davis Chiramel, who had donated one of his kidneys to a Hindu man in 2009, I had been longing to make the same sacrifice. Somewhere, I hoped, I would meet the deserving person. What mattered to me most was that the decision would save a life. I realised that the person seated beside me in the bus was the most deserving person,'' he said. The following day, they went to the hospital to start the procedure for donation and transplant. The tests have been positive. "A few counseling sessions and a final nod from the medical board remain. 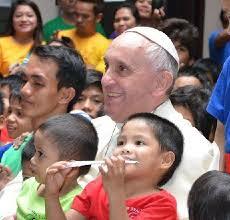 In all probability, the transplant will take place within a month," said the priest. The Lord's Supper ensures that we can remember Jesus from any place. Apollo 11 landed on the moon on Sunday, July 20, 1969. Most remember astronaut Neil Armstrong's first words as he stepped onto the moon's surface: "That's one small step for man, one giant leap for mankind." But few know about the first meal eaten on the moon. Dennis Fisher reports that Buzz Aldrin, the NASA Astronaut had taken aboard the spacecraft a tiny pyx provided by his Catholic pastor. Aldrin sent a radio broadcast to Earth asking listeners to contemplate the events of the day and give thanks. Then, blacking out the broadcast for privacy, Aldrin read, "I am the vine, you are the branches. He who abides in Me, and I in him, bears much fruit." Then, silently, he gave thanks for their successful journey to the moon and received Jesus in the Holy Eucharist surrendering moon to Jesus. Next he descended on the moon and walked on it with Neil Armstrong. (Dan Gulley: "Communion on the Moon": Our Daily Bread: June/July/August, 2007). His actions remind us that in the Lord's Supper, God's children can share the life of Jesus from any place on Earth — and even from the moon. God is everywhere, and our worship should reflect this reality. In Psalm 139 we are told that wherever we go, God is intimately present with us. Buzz Aldrin celebrated that experience on the surface of the moon. Thousands of miles from earth, he took time to commune with the One who created, redeemed, and established fellowship with him. Hoxha was gone a few days later on April 11, 1985. Communist rule collapsed in Albania in 1992 and Christians and Muslims reopened their churches and mosques for worship. Finally the Lord of the Eucharist has ruled the hearts and minds of the people of Albania. When push comes to that famous shove, it doesn't matter what Mother Teresa or you or I believe about the Eucharist. What does matter is what Christ Himself believes about it. For the answer one must go to the record. Two hundred years ago, a beautiful young Episcopalian woman accompanied her husband, a merchant, to Italy, leaving four of their five children at home with family members. They had sailed for Italy hoping that perhaps the change in climate might help her husband, whose failing business had eventually affected his health adversely. Tragically he died in Liverno. The grieving young woman was warmly received by an Italian family, business acquaintances of her deceased husband. She stayed with them for three months before she could arrange to return to America. The young widow was very impressed by the catholic faith of her host family, especially their devotion to the holy Eucharist: their frequent attendance at Mass, the reverence with which they received Holy Communion, the awe they showed toward the Blessed Sacrament on feast days when the Eucharist was carried in procession. She found her broken heart healed by a hunger for this mysterious presence of the Lord, and, upon returning home, requested instruction in Catholic Faith. Soon after being received into the Church, she described her first reception of the Lord in the Eucharist as the happiest moment of her life. It was in St. Peter’s Square on September 14, 1975, Pope Paul VI canonized this woman, Elizabeth Ann Seton, as the first native born saint of the Unites states. The Eucharist for her was a sign and cause of union with God and the Church. The Eucharist, (the body and blood of Christ) teaches us the importance of community, the bond that results from this sacrifice. Just as numerous grains of wheat are pounded together to make the host, and many grapes are crushed together to make the wine, so we become unified in this sacrifice. Our Lord chose these elements in order to show us that we ought to be united with one another and to allow and work with the Holy Spirit in transforming us into Our Lord Jesus Christ. Christ is the head and we are the body. Together we are one. That which unites us is our willingness to sacrifice our time and talents for our fellow members in Christ’s mystical body. This is symbolized by our sharing in the same bread and the same cup. Hence, Holy Communion should strengthen our sense of unity and love. We have tarnished God’s image within us through acts of impurity, injustice and disobedience. Hence, there is always need for repentance, and a need for the sacramental confession of grave sins before we receive Holy Communion. We should remember the warning given by St. Paul: "Whoever, therefore, eats the bread or drinks the cup of the Lord in an unworthy manner will be answerable for the body and blood of the Lord. Examine yourselves, and only then eat of the bread and drink of the cup. For all who eat and drink without discerning the body, eat and drink judgment against themselves." [1 Cor. 11:27-9]. Hence, let us receive Holy Communion with fervent love and respect -- not merely as a matter of routine. St. Paul is speaking also of the mystical body of Christ, i.e., the people of God gathered at the altar. Such a union, plainly, means that our outward piety towards the consecrated Bread and Wine cannot coexist with rudeness, unkindness, slander, cruelty, gossiping or any other breach of charity toward our brothers and sisters. 7. Let us become Christ-bearers and conveyers: By receiving Holy Communion we become Christ-bearers as Mary was, with the duty of conveying Christ to others at home and in the workplace, as love, mercy, forgiveness and humble and sacrificial service. As we celebrate this great feast of faith, let us worship what St. Thomas Aquinas did not hesitate to call, "the greatest miracle that Christ ever worked on earth ...... my Body ........ my Blood". Before the greatness of this mystery, let us exclaim with St. Augustine, "O sacrament of devotion! O sign of unity! O bond of charity!" Let us also repeat St. Thomas Aquinas' prayer of devotion in the presence of the Blessed Sacrament: "O Sacrament most holy! O Sacrament divine! All praise and all thanksgiving be every moment thine!" The former archbishop of San Francisco, John Quinn, loves to tell the story of the arrival of Mother Teresa and her Missionaries of Charity to open their house in the city. Poor Archbishop Quinn had gone to great efforts to make sure that their convent was, while hardly opulent, quite comfortable. He recalls how Mother Teresa arrived and immediately ordered the carpets removed, the telephones, except for one, pulled out of the wall, the beds, except for the mattresses taken away, and on and on. Explained Mother Teresa to the baffled archbishop, “All we really need in our convent is the tabernacle” (Msgr. Timothy M Dolan in “Priests of the Third Millennium” 2000 p. 218). Dominic Tang, the courageous Chinese archbishop, was imprisoned for twenty-one years for nothing more than his loyalty to Christ and Christ’s one, true Church. After he had spent five years of solitary confinement in a windowless, damp cell, he was told by his jailers that he could leave it for a few hours to do whatever he wanted. Five years of solitary confinement and he had a couple of hours to do what he wanted! What would it be? A hot shower?A change of clothes? Certainly a long walk outside? A chance to call or write to family? What would it be, the jailer asked him. “I would like to say Mass,” replied Archbishop Tang. [Msgr. Timothy M. Dolan, Priests of the Third Millennium (2000), p. 216]. The Vietnamese Jesuit, Joseph Nguyen-Cong Doan, who spent nine years in labor camps in Vietnam, relates how he was finally able to say Mass when a fellow priest-prisoner shared some of his own smuggled supplies. “That night, when the other prisoners were asleep, lying on the floor of my cell, I celebrated Mass with tears of joy. My altar was my blanket, my prison clothes my vestments. But I felt myself at the heart of humanity and of the whole of creation.” (Ibid., p. 224). Today’s feast of the Most Holy Body and Blood of Jesus constantly calls us beyond ourselves to sacrificial love for others.